Using knowledge of the first suffrage society in the world in England Henrietta Dugdale started the first Suffrage Society in Australia in Melbourne in 1884. Soon such societies sprang up all around Australia. They waxed and waned for the next few decades. Henrietta, besides her campaigning and social work, was known for a biting wit, breaking the bones in her corset,and for changing other restrictive dress conventions of her day. Country born and bred Louisa moved to Sydney and began Australia's first magazine for women THE DAWN in 1888. Louisa's influence was perhaps as important to Australia both politically and culturally as was her son Henry's work,but not so well-known. HER WORDS : A woman's opinions are useless to her. She may suffer unjustly, she may be wronged, but she has no power to weightily petition against man's laws,no representatives to urge her views,her only method to produce change is to ceaselessly agitate'. Through the Suffrage Societies and the influence of Magazines like DAWN, the number of groups where women could be educated through reading increased. 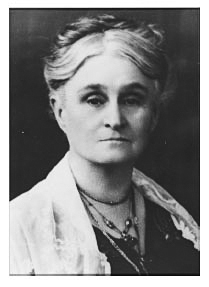 However it soon became apparent that women needed to learn the skills of debating and public speaking if they were to ever win the right to vote.To this end Edith Cowan was inspired in 1894 to turn Perth's St George Reading Circle, into the KARRAKATTA CLUB. The club was instrumental in her becoming Australia's first woman elected to a parliament, the W.A.State Parliament. She has been honored in many ways for her considerable social contributions, including having a University established in her name. When it was realised that Suffrage Societies, Magazines and Clubs needed more action to back them up the suffragists created petitions. Victoria created the MONSTER PETITION with 30,000 signatures collected over six weeks, (nearly as good as Get Up), the petition claimed that 'Women should Vote on Equal terms with Men'. The bill was tabled in Parliament in September 1891, with the support of then Premier James Munro. Mayebanke Selfe-Wolstenholme established her home in Marrickville as Maybanke College after her husband left her with several children to support. Education became her driving force within the suffragist movement.She knew that without education the vote would never come.She knew Education needed to begin early. In 1895 she helped set up the first free Kindergarten in Australia at Wooloomooloo. 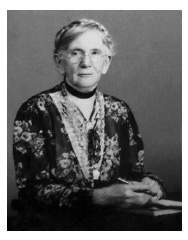 When she married Philosophy Professor Frances Anderson she became involved with education at University level. She was a poet and a singer and used her skills to create material for young children.Her other poetry appears to have been an influence on one of Australia's iconic poems. HER ART: Singing and poetry writing. 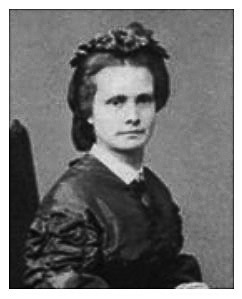 Rose Scott was home educated and influenced by Shakespeare's The Taming of the Shrew and by J. S. Mill's The Subjection of Women (1861). 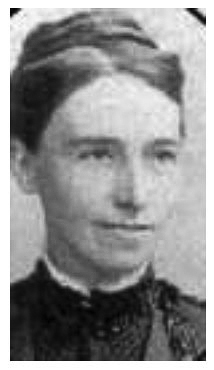 The adoption of her sister's boy gave her insights into education and she published an article in the Sydney Morning Herald (1889) entitled 'Home lessons' which condemned cramming and competitiveness in the education system. She probably would disapprove of NAPLAN. She was well connected to Sydney Society and allowed her home in Woollahra, to become a salon where politicians, judges, philanthropists, writers and poets gathered. CHANGING LAWS to raise the age of consent to 16 and to make the public soliciting of prostitutes and abandoning a woman seduced under promise of marriage punishable offenses was her driving ambition. In 1892 such a Bill was laughed out of court which made her even more determined. The chance came In 1903-04. The work related to the abandoning of a woman seduced under promise of marriage. She and others campaigned for the release of Ethel Herringe, a young woman convicted for shooting her ex-employer at Cowra. Queenslander Margaret Ogg was home-schooled, taught to dress for dinner and play the viola. When Tasmanian women won their state voting rights in 1903 her social conscience primed by working with her Minister father led to her setting out to win the minds of Queensland country women. She toured the country in a horse and sulky, and used kerosene lamps to light her street meetings. Her idea of touring was taken up in Britain. 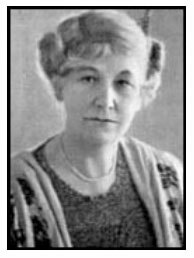 She edited the Women's Section of UNITED GRAZIER and wrote poems under the name of Ann Dante. Queensland women won voting rights in 1905 but she continued working for women. Dora Montefiore was born in England in 1874, but went to Sydney where she met and married Jewish merchant George Barrow Montefiore. They had two children. In 1889, her husband was lost at sea. When she found she had no automatic right to guardianship of her children Dora became an advocate of women's rights. 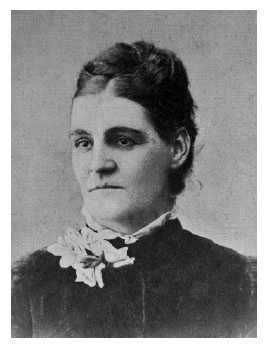 She held the first meeting of the Womanhood Suffrage League of New South Wales at her home on 29 March 1891. 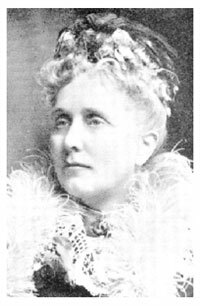 In 1892 she left Australia and settled in England where she joined the recently formed Women's Social and Political Union. In 1898 she published a book of poems SINGINGS THROUGH THE DARK. In 1906 she was arrested and imprisoned for refusing to pay taxes pay taxes because she claimed 'Taxation without representation is tyranny.' Because she helped form British Communist Party she was not allowed back into Australia to visit her son. In 1913 she helped evacuate starving Irish children. She was arrested for kidnapping and later released. 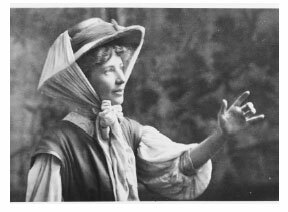 Born in 1877 in Adelaide into a Methodist family by1905 aged 28 she had already voted twice before travelling to London. Influenced by the hard-won franchise and by the writings of Walt Whitman and Henrik Ibsen her politIcal ideas were well developed. Studies and skills in music/acting gave her chances to perform in many places. Encouragement to use her skills for something more meaningful Muriel joined the Women's Freedom League'.They believed in activism but not violence. She took part in several actions in Britain and was imprisoned for a month in Holloway Gaol. She went back to Australia in 1910 and toured to assist states yet to be granted the vote on State issues. On return to Europe she married in 1914. She worked with mothers and poor children of Lambeth in London. After Suffrage was granted to British women she stood for parliament but was unsuccessful. South Australians have established a 'Muriel Matters Society'. You can find it on the net. HER MALE SUPPORTERS: George bernard Shaw. Prince Peter Kropotkin. In England, as the eldest child of a Chartist Emma would accompany her father to meetings sixteen miles from home. Walking. She supported four children in Manchester by sewing twelve hours a day for six days a week after their father died. Emma migrated to Australia with her second husband. When he died she married Andrew Miller. 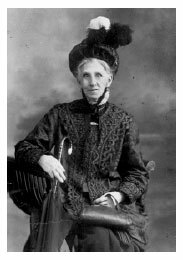 After years of campaigning for equal rights and equal pay she became Old Mother Millar Australian suffragist and proud of her title 'The grand old Labor woman of Queensland'. In 1890 she helped to form a female workers' union. In 1891 she marched with shearers' strike prisoners, and was jailed. 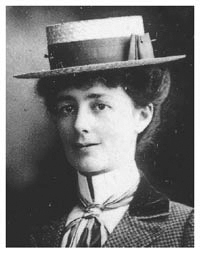 When released she travelled west, organizing for the Australian Workers' Union. By 1902 although women had a federal vote they could not vote in Queensland state elections. Her MILITANT ACTIVISM was most apparent on 'Black Friday' of the 1912 strike in Brisbane .Emma led a large contingent of women to Parliament House, braving the batons of foot and mounted police. She became infamous through self-defence with a hat-pin. HER ART: Defence with Hat-pin. 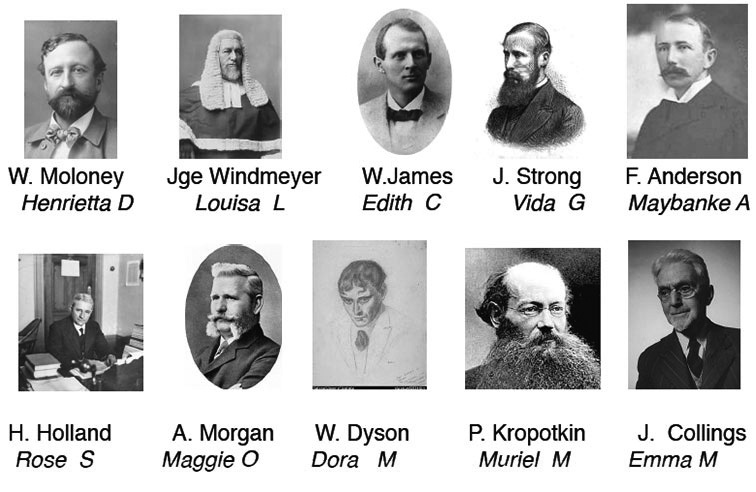 'GOOD BLOKES ALL' who helped the Suffragists named underneath their names. There were many others but these 'stood out' when they 'stood up' for women's rights.